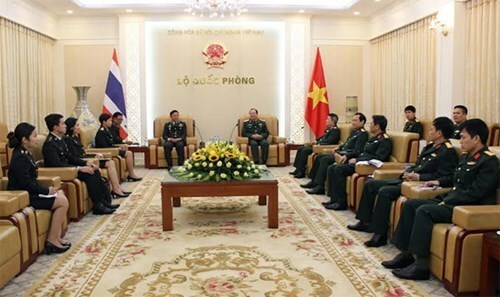 Hanoi (VNA) - Deputy Chief of the General Staff of the Vietnam People’s Army Pham Ngoc Minh received Nuchit Sribunsong, head of the Office of Policy and Plans under the Royal Thai Army’s Directorate of Joint Operations, in Hanoi on March 22. Both host and guest spoke highly of relations growth between Vietnam and Thailand across sectors, including defence. They agreed that bilateral defence ties have been strengthened over time, contributing to ensuring peace and security in each country and across the region. They took note of some cooperation highlights, including joint air and naval activities, engagements in education-training and military medicine, as well as exchanges among young officers and delegations of different levels. Nuchit Sribunsong reported on his earlier working session with the Defence Ministry’s institute of external relations in defence, saying both sides have reached an agreement on cooperation and consultation mechanisms.